The urgency of Earth Day has changed. In 1970, when America celebrated its first Earth Day, hybrid cars and eco-friendly light bulbs weren't even a blip on the radar screen. Now is a far different time. In 2013, celebrating Earth Day has become a critical moment around the globe to think about and act on ways to "future proof" our world against a variety of environmental and climate-related concerns -- especially in our most vulnerable urban regions. In a previous post, I spoke about the opportunities that exist within climate change adaptation to improve and transform slum communities, and how planning not for, but with, the urban poor can curb the cycle of poverty. Global Communities has applied a similar approach in another part of the world -- Ghana -- where about half of the urban population lives in slum settlements. Ghana's success story with water is fitting for an Earth Day discussion. As we know, water plays a key role in good hygiene and sanitation. In slums -- typically characterized by poor land conditions, high density population, and a lack of adequate government services -- the additional challenge of limited access to clean and treated water can pose serious health and safety implications. These were the conditions that spurred the Water Access, Sanitation and Hygiene for the Urban Poor (WASH-UP) program, our USAID-supported urban water and sanitation project in Ghana. In Ghana, the water supply has declined significantly since the late 1990s as urban population density increased tremendously.  This has led to water rationing. Most households in Accra with yard or in-house water connections receive water at most twice a week, although many areas now go for weeks without any water at all. Daunting conditions, to be sure. But at Global Communities, along with our local partners, we are implementing many innovative ways to ameliorate this situation and improve hygiene and sanitation for slum dwellers in Accra. One such innovation is Biofil latrine technology. 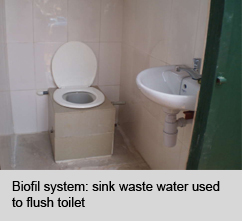 Biofil is a greener, safer, and more cost effective way to manage human waste. The Biofil Digester combines the benefits of a flush toilet system with those of composting toilets, in that solid waste is degraded, decomposed and converted into rich, safe soil -- courtesy of living organisms which include both micro-organisms, such as bacteria, and macro-organisms, such as earthworms, which are housed in a section of the facility. The system also makes hand-washing an easy and integral part of the process through a hand-washing facility that is connected to the toilet, which turns the water a person uses to wash their hands into the water that flushes away the waste. 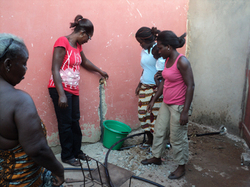 The Biofil Digester has proven economically and environmentally-friendly in the hard-scrabble regions of Accra, especially where water supply is at risk; where services to maintain sewers or septic system services are inconsistent or absent; and where buildings are challenged by adverse soil, like clay or solid rock. 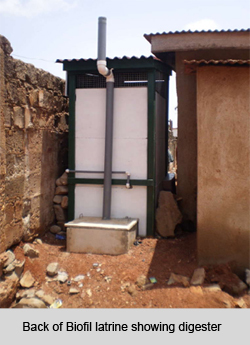 Since 2011, 13 of the toilets have been installed in the Accra neighborhoods of Ayidiki and Nima. And they've had a transformative effect. In March 2013, Global Communities celebrated World Water Day at the Accra home of a woman named Madam Donkor, a recipient of a Biolfil toilet. Madam Donkor raved about the benefits of her Biofil, reporting that her family of 15 now uses only 36 liters of water to wash their hands and flush the toilet for a whole week. This compares to a modern western toilet which uses around six liters per flush and older models which used to use up to 30 liters per flush. Another Biofil recipient in Ayidiki, George Clottey, lived in a compound that lacked adequate space for a conventional septic tank or latrine. However, the more compact and modern Biofil toilet fit within his living space. He and his family have benefited from their Biofil system for two years now. A key part of Global Communities' collaborative model is ensuring an economic benefit for the people within the communities where we work. To that end, the Biofil Digester is a system made by Africans, for Africans. The toilet was manufactured locally, using locally-sourced materials. Others within the community are reaping economic benefits, too. The toilets have helped Ghanaian farmers as the byproducts are used as fertilizers and soil conditioners. The system has a simple yet effective "drain field," or perforated pipes, that distribute bio-filtered waste directly to vegetation or farmyards. And other locals have developed businesses in aquaculturing, in which they grow the earthworms used in the system and use or sell them to feed fish or seed new toilet installations. Through the introduction of a simple, replicable and affordable sanitation system that protects the land and yields positive benefits for homeowners, farmers and local businesses, the WASH-UP project represents something worth celebrating this Earth Day. It's curbing pollution, keeping slum residents healthy and helping eliminating diseases like cholera, dysentery, and scabies. And it's an efficient program to boot. To date, 2,700 households involved in the project now have connections to safe, piped water. By showing what is possible through modern toilet technology, WASH-UP has made a life-changing difference for residents and stakeholders in slum communities within Accra. It's yet another way that Global Communities is working to bring about sustainable changes that improve the lives and livelihoods of the vulnerable.